Paint Your Old Golden Oak Cabinets! Saddled with old golden oak cabinets? Why not paint them. I did and it was very easy (though time consuming). I started by removing the doors from the cabinet base and unscrewing all the hardware. Then I lightly sanded all the surfaces. A good primer like Zinsser’s Bulls Eye 123 covered easily and provided a great base for the finish coat. I used Valspar’s Kitchen and Bath Enamel in a Ben Moore color called Antique Parchment on the top cabinets and a Valspar color called Jekyll Club’s Cherokee Rust on the bottom cabinets (there, I plugged both companies). The cabinets looked great but I wasn’t done. In our house with kids, etc, etc, we tend to bang things up a bit so I mixed up a glaze that included some Cognac Snifter 1148 (a Ben Moore color used in an adjoining room) for the top cabinets and Branchport Brown HC-72 for the bottom. I painted the glaze into the seams and cracks in the doors and wiped it off with a rag. The look is rustic but cheerful and allows the new oil-rubbed bronze hardware to finish the room. And any future little scratches will not show. I love it!! I tiled the backsplash (white primer in the before photo) with simple white subway tiles from Lowe’s. Not an expensive project, but I did purchase a wet saw for cutting the tile. (Looks like I have more tile projects in my future or maybe I can rent the saw out to my neighbors!) I am very happy with the end result, imperfections and all, and I do not miss my golden oak cabinets! I would highly recommend painting cabinets if a total kitchen re-do is not in the budget or if you’re planning to sell your house and you have ugly kitchen cabinets. The project will be worth it! 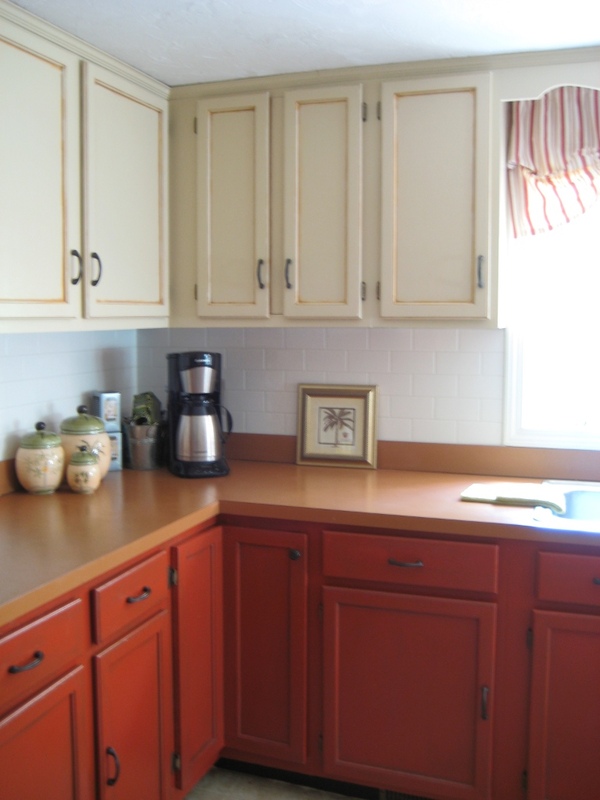 § 10 Responses to Paint Your Old Golden Oak Cabinets! I stumbled across your blog looking for a tip on painting our guest bathroom and now I am inspired to paint our kitchen cabinets! Thanks for the inspiration.. your kitchen looks great. When you do your backsplash please post some photos! Thanks, Carrie. I will post photos of my backsplash. I have a plan — just need to DO it. Thanks for visiting my blog! I am looking for a color for the walls in my kitchen that is going to match with my golden maple cabinets in my new home. I would like a southwestern touch or flair to it. Something maybe loud or bright. I have an attached informal dinning room too. What color’s do you suggest? The flooring is a white stone, the counter tops are also a shiny white tile and I want to keep the cabinet color the same. How about Baked Terra Cotta (Ben Moore 1202) for the kitchen and Harvest Bronze (1146) for the dining room? I am going to paint our living room. The floor is a light oak hardwood. The TV stand and coffee table are walnut. The couch is gold with brown specks in it (along the same color as the floor). I have two slipper chairs. One is a leaf pattern with browns, golds and blues and the other chair has stripes with the same colors as the leaf pattern chair. I was thinking of painting the focal wall (the wall you see when you walk in the front door (and the wall with the couch on it) a brown and the other three walls a blue. The window trim and celing are white. What do you think? Would this be too much going on? Currently the windows have ugly white mini blinds. I am going to change these, but not sure what to do. The windows face the street and I like privacy when I want it, but I like the natural light when I want it too. I don’t have anything hanging on the walls yet and there is no ceiling light. I want to add some light with lamps and such, but not sure what to use. Wow, there is alot to address here, but I hope you can help me. So sorry for the delay… Here I am now. I think you have a very good idea for painting the walls blue in your living room. With the brown, gold, and blue furniture plus the dark walnut woods and light oak flooring, the blue will create a wonderful backdrop. Although I’m not sure what shade of blue you have in your furniture, try to pick a blue for the walls that’s on the gray side — not too clearly blue. Have a look at Ben Moore’s Gentle Gray 1626 or if your blue is more turquoise, see Silvery Blue 1647. Either of those will create a soft, gentle background color for your furniture. Yes you can use brown for your accent wall but I would put some blue cushions on your gold/brown sofa to tie that area into the rest of the room. For the windows, you can replace the miniblinds with shades if you want to. Woven Roman shades are very textural and they offer some privacy if they’re lined. Then I suggest a brushed nickel curtain rod with brown curtain panels on either side of each window. That will again tie in with the accent wall and the other browns in the room. If brown seems to heavy for the windows, then just use white panels. If you’re short on patterns in the room, you can use a patterned window panel (in the color scheme if you can find them). I would avoid ceiling lights unless you plan to install either pendants, a chandelier, or recessed cans. Single ceiling lights in the middle of the ceiling produce a diffuse light that’s really ugly. Stick with table lamps/torchieres/standing lamps. An uplight in the corner under a large plant can add more ambiance. Choose art because you like it and not because it matches your color scheme. Art on the walls should stand on its own. Try to go big with the art and accessories instead of having lots of little things scattered around the room. Much more dramatic impact that way. Also don’t forget to add a large area rug to define your seating area where the sofa/chairs are. You can add an accent color in the rug if you’d like– bring in some warm colors perhaps? Hope that helps. You’re off to a great start! Enjoy your shopping and pulling the room together. Thanks! You never realize how many cabinets you have until you start removing all the hardware and sanding and painting them one by one. But I’m glad I did it! At some point (before we sell), I’ll probably have to reface them, but the paint is great for now. Let me know if I can help you out on any more projects on the inside. And good luck with all your outside projects! You’re on your way! Just wondering how the glazed cabinets held up? I am dying to do this, but terrified. I applaud you! The glazed cabinets have held up much better than if I hadn’t glazed the cracks and crevices. The aged cabinets still look aged. Any imperfections are part of the aged character. An easy way to camouflage old cabinets. You are currently reading Paint Your Old Golden Oak Cabinets! at Your Home & Color Coach.